Moist pumpkin bread with just the right amount of spice just like Starbucks'! About two years ago I posted my first Starbucks Copycat Recipe which was this Chocolate Cinnamon Bread. It has now become one of my all-time favorite recipes I have made. That being said, I wanted to replicate another one of Starbucks' greats, their pumpkin bread. I typically enjoy anything pumpkin related but I do feel as if pumpkin recipes are often over or under spiced. Of course, Starbucks has mastered their craft and their recipe has the perfect amount of pumpkin and perfect amount of spice. If you are wanting to impress your uppity, daily, Starbucks-going friends, just make this and bring it to them (free of charge) and they will love you. This bread is made with surprisingly simple ingredients with surpringly few steps. 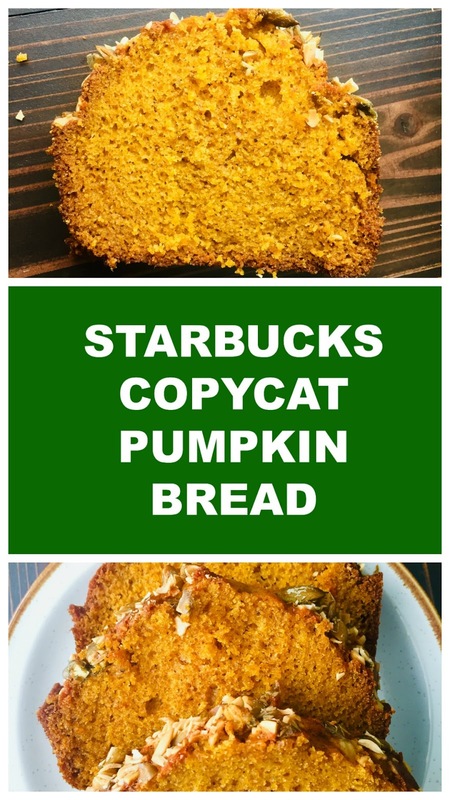 Hope you try this out and enjoy it as much as we have enjoyed our Starbucks' copycat recipes! Let rest and cool, then serve and enjoy!